Patrick Kane and Jonathan Quick, the past two Stanley Cup playoff MVPs, are among the 48 players invited to the United States men's pre-Olympic hockey camp. Patrick Kane and Jonathan Quick, the past two Stanley Cup playoff MVPs, are among the 48 players invited to the United States men’s pre-Olympic hockey camp. Of the 48 players who will attend the Aug. 26-27 camp at Kettler Capitals IcePlex in Arlington, Va., 16 have previous Olympic experience, including Los Angeles Kings captain Dustin Brown and the Minnesota Wild duo of Zach Parise and Ryan Suter. The three aforementioned players were alternate captains with the 2010 Olympic silver medalists. 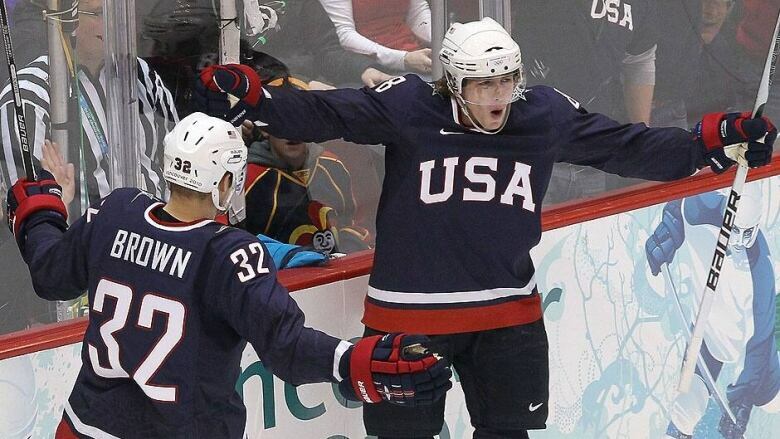 Nine were members of the bronze medal-winning U.S. team at the 2013 World Championships in Sweden and Finland: Goalie John Gibson, defencemen Justin Faulk, Erik Johnson and Jacob Trouba and forwards Nick Bjugstad, Alex Galchenyuk, T.J.Oshie, Craig Smith and Paul Stastny. Head coach Dan Bylsma will welcome 30 first-round NHL draft picks to camp. Teams will be asked to submit a 25-man roster by Dec. 31, which includes two more players than at the 2010 Vancouver Games. Each country can now name 22 skaters and three goaltenders. The U.S. plays its first game Feb. 13 against Slovakia. Slovenia and host Russia are the other Group A teams.